Sweet roasted chantenay carrots are drizzled in a tangy, creamy feta dressing in this colourful salad. It’s ever so simple and ever so good! Heat the oven to 200°C/180°C fan/gas 6. Toss the carrots in a roasting tin with a glug of olive oil and roast for 25 minutes or until just tender. Allow to cool to room temperature. Crumble the feta into a bowl and whisk in the yogurt until smooth, then loosen the mixture with 4 tbsp water. Season well with black pepper. Heat a glug of olive oil in a frying pan, add the breadcrumbs and fry until just golden, then stir in the crushed garlic and transfer to a plate to cool. 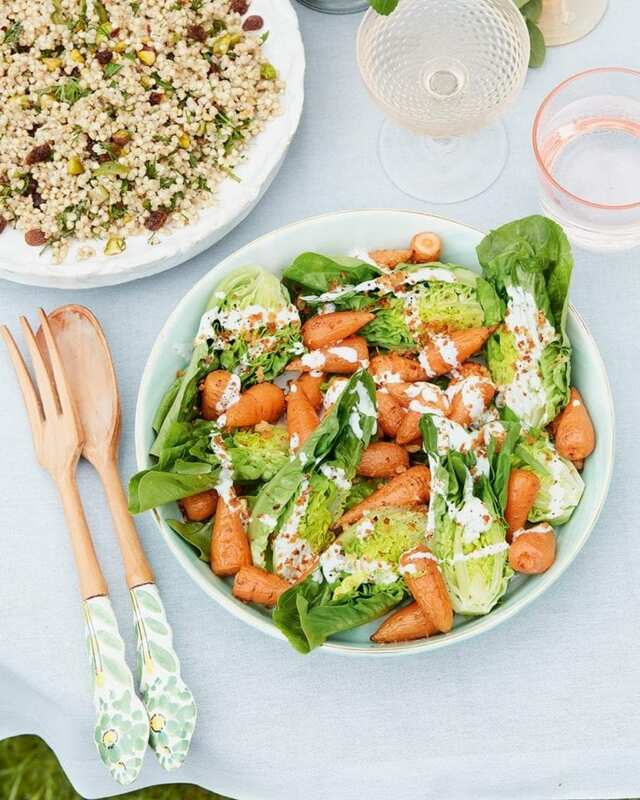 To serve, assemble the carrots and lettuce on a platter or serving dish, drizzle over a little of the feta dressing and sprinkle with garlicky breadcrumbs. Serve the remaining feta dressing on the side. Roast the carrots and make the dressing up to 24 hours in advance. Keep chilled in separate airtight containers. Bring to room temperature to assemble.